An EBF Novice Stakes over 5f 21y on heavy going. Seven two-year-olds debutantes take part at Windsor: five colts and two fillies. Testing going will make this interesting. Michael Bell doesn't have many early juveniles so it is a fair pointer Artair has something going for him. This bay colt is a son of Kodiac and £55,000 yearling purchase. Well drawn in stall three and positive jockey booking with Jamie Spencer riding. Blown By Wind hails from Mark Johnston's stable. They have fielded a couple of juveniles who have been fancied in the betting. Neither won but far from disgraced, giving the impression they would appreciate better ground. This son of Invincible Spirit is well drawn in stall one (if the keep to the near-side rail). This home bred is out of a decent mare who raced just three times: winning on her first and second start, taking the Sweet Solera Stakes (Group 3). 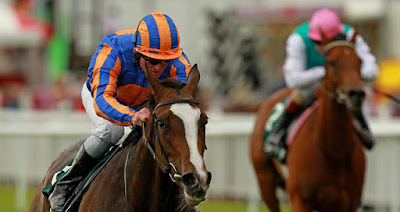 She was fancied in the 1000 Guineas but was virtually pulled up and never raced again so must have suffered an injury. Definitely a fair type on paper and the stable have a few to measure this ones ability. Rod Millman has a couple of horses entered. He has unleashed a few of his better juveniles at this course over recent years so worth noting. In general, his juvenile struggle to win on debut. Greyzee is a grey son of Zebedee out of a winning but little mare. He was bought in by the vendor for £10,000. Greeley has a wide draw in seven, which may be the best of the lot if jockeys venture to the far side rail, which is often the case of testing ground. This bay colt is a son of Sir Prancealot, who has done pretty well as a new sire these last few years. He cost £18,00 at the yearling sales. Mick Channon has led the way with this two-year-olds this season. A Brocklesby Stakes winner who made it two from two in the mud at Bath. Bungle Inthejungle stole a win, while a couple of others have disappointed. One of two fillies, Solesmes is owned by Mick Channon and 3,000G foal. May appreciate further in time. If priced 8/1 or bigger SP, best watched. Never one to let the grass grown under his feet, David Evans has fielded a number of juveniles this season. He has form horses to assess the ability of his newcomers which is a plus. Awake In Asia is a son of Dragon Pulse and £65,000 yearling purchase. The mare won five times and achieved a highest official rating of 91. The stable send some of their better prospects here and a horse worthy of note especially if well backed. Merarini cost just £3,000 at the yearling sales and best watched. Conclusion: Not the easiest of races to assess. The betting suggests four have a fighting chance although Millman's pair are not without a hope is fair standard. I would watch the betting for Solesman, a filly against the colts and a cheap purchase. Could drift in the betting. The betting guide will tell the story but even if fancied I would watch. Artair, Blown By Wind and Awake In Asia are most interesting. The betting is the best guide for Awake In Asia. Blown By Wind could go well for Johnston. Artair is interesting being an early horse for Michael Bell. He doesn't have many early types and it could detail a sharp horse with promise. However, I will take a watching brief.